Halifax native Marc Djokic has won the $125,000 Prix Goyer classical music award for a collaborative emerging talent. It's just sinking in for Marc Djokic that he has won one of the largest classical music prizes in the world. 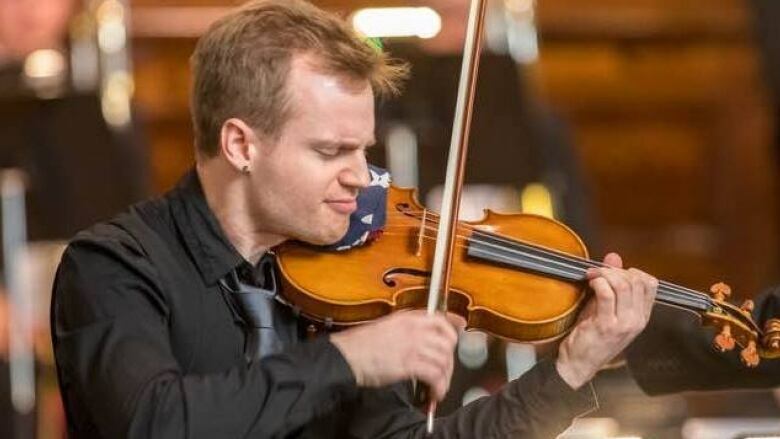 Monday morning, the violinist from Halifax learned he is this year's recipient of the the $125,000 Prix Goyer classical music award, which recognizes a collaborative emerging talent. "I had really no indication that I was up for the award … I was just really happy," Djokic said. "This prize not only represents me, but a lot of the musicians and the composers I've worked with before earning this prize." Billed as the biggest prize in Canada for classical music, the award was created in honour of the late Jean-Pierre Goyer, a former federal cabinet minister and chairman of the Conseil des arts de Montreal and the Orchestre Metropolitain. Winners are chosen in recognition of their diverse early career of musical collaborations with Canadian and international established artists. Djokic credits his work with other artists, including percussionist Beverley Johnston, pianist Jamie Park, his sister, cellist Denise Djokic, and parents, Philippe Djokic and Lynn Stodola. Over the past two years, Djokic been putting together collaborative videos of his work with the classical music channel Nonconcerto. "Really what I'm trying to show people [is] that it's not just playing your instrument by yourself, but really celebrating and sharing music-making with other people. It's a beautiful human experience and something that really brings us together," he said. He said the award will allow him to continue those collaborations. Djokic first studied with his father, whom award organizers called "one of Canada's great soloists," and then with the Cleveland Institute of Music's Young Artist program, the New England Conservatory, and Indiana University's Jacobs School of Music. He has performed with several orchestras, including the Toronto Symphony Orchestra, Quebec Symphony Orchestra, PEI Symphony, the National Arts Centre Orchestra and the Calgary Philharmonic Orchestra. Though he left Nova Scotia as a teenager, Djokic said he tries to return several times a year. His next Halifax performance will be in the spring of 2018 with the Nova Scotia Youth Orchestra, a group he played with for many years. He said he was exposed to Celtic music and collaborations with other local artists through the orchestra. "It was really, you could say, the starting ground for my collaborations and thinking in terms of broad musical styles," he said. "I always feel I need to return to really feel where I came from and where this all started from. I really look forward to that."